Since that first glimpse, I’ve been psyched to see Ready Player One. The trailer looked amazing. And to the movie’s credit, the movie delivered on those stunning visuals... It just let us down in a lot of other areas that mattered. No one’s denying the movie is gorgeous. The eye candy is everywhere, and the easter eggs are almost countless. It’s just that the movie is only as satisfying as the popcorn I had with it, and just about as memorable. I confess I haven’t read the book yet— I’ve preferred to see the movie first since Jurassic Park. So any merits or shortcomings in this review are strictly about the movie. The problems with Ready Player One come down to three things: An over-stuffing of nostalgia, a plot that moves in one direction only, and zero attention paid to character. RPO’s addiction to nostalgia— while impressive— feels artificial because it was re-created by Steven Spielberg, with music from Alan Silvestri: the people directly responsible for the material that nostalgia feeds on. 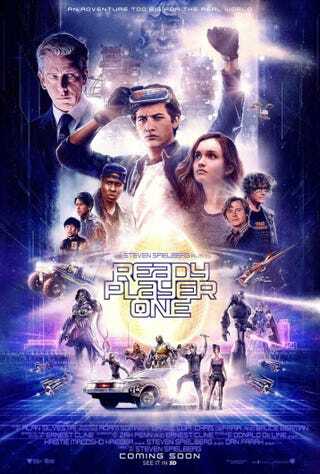 I’m deeply curious about a version of Ready Player One directed by someone who grew up on a diet of Spielberg’s films, not Spielberg himself. The plot moves forward like a conveyor belt. This is a problem inherent to stories about a game, let alone a game created by someone who’s died. It can only end satisfyingly on the game maker’s terms. In such an arena, the hero can only do what someone smarter anticipated he’d do. Let’s move on to ‘characters’. Tye Sheridan plays Parzival, taking his name from the Arthurian Knight who found the Holy Grail. He’s brave, down-trodden and staunchly independent, right up until the moment that he’s not. His chief rival is Art3mis, played by Olivia Cooke. Art3mis is capable, resourceful, also independent-until-she-isn’t, and most importantly, accessible. She resists Parzival’s romantic overtures for the standard opening salvo, but gradually comes around to him with little motivation. Rest assured by the end of the movie, they’ve achieved their relationship upgrade. The villain Sorrento is played by Ben Mendelsohn, perfectly cast as the corporate bad guy who stands in the hero’s way because greed and power and blah. Playing actual characters are Lena Waithe and TJ Miller as Aech and I-Rok respectively. What sets them apart? Intrigue, drive, relationships, and above all the ability to change. Aech is clever, funny, and cares about their companions. I-Rok is a leet gamer who actually disagrees with other characters and demonstrates the ability to change his mind. Which brings us to the movie’s main problem: none of the main characters change. They learn nothing, and nothing they do is motivated by any personal reason— at least, nothing that could be shown rather than explained through heavy-handed exposition. Parzival refuses to Clan Up until he doesn’t. Art3mis isn’t interested in Parzival romantically until she suddenly is. Parzival’s rallying cry to raise an army to help him with the final challenge is grand, sweeping, and completely unearned. There’s no lesson of teamwork, there’s no ego to overcome, he simply does the thing because the story demands he do the thing. Aech chooses their moment to reveal themselves, it isn’t forced because Parzival blurted something out at the wrong moment. I-Rok shows independent thinking and changes his mind when he realizes just how desperate Sorrento is to win the game. A story where the supporting characters are more interesting than the leads is a story with problems. Ready Player One is absolutely gorgeous to look at. It’s fun, with moments of genuinely surprising cleverness, and it will flood your brain with all the Nostalgia Happies the trailer promised. Beyond that, it’s a forgettable but enjoyable popcorn flick, albeit one overly dependent on exposition.